This email address will be used for sending email notifications to your customers and it will allow them to add replies to a ticket by replying directly to the email notification they have received. Additionally, you can enable automatic ticket creation if someone sends an email to your default support email address from above. From your account settings section, you can enable "Email Tickets" feature which will automatically turn any emails you receive on your_account_subdomain@mail.support-hub.io to private tickets. Here you will also need to define a default support category for those tickets. NOTE: Purchase code verification will not be performed for tickets created via email! Make sure that you select the appropriate default category here or, if you don't want to allow ticket creation without a purchase code verification, consider disabling the "Email Tickets" feature. If you already have an email address that you want to use (for example support@yourcompany.com) you can forward the emails you receive on support@yourcompany.com to your_account_subdomain@mail.support-hub.io and any forwarded emails will be automatically converted to support tickets. 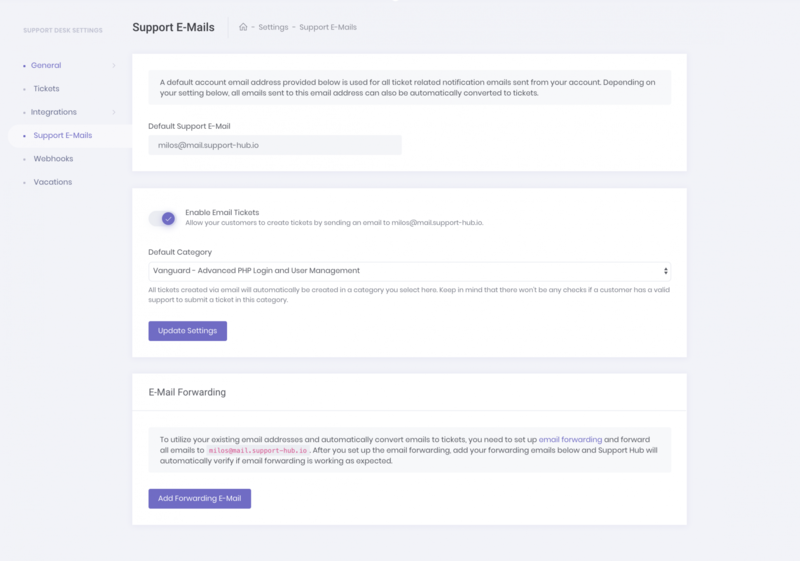 Most email providers will send a verification email to a forwarded email address (your_account_subdomain@mail.support-hub.io in your case) and that email will automatically appear as a ticket in your Support Hub account. This ticket usually contains instructions on how to verify the forwarding email and enable forwarding. As soon as you complete the forwarding configuration, you are ready to start receiving the support tickets via email. This step is completely optional and, if you have configured the forwarding settings properly, tickets will be automatically created when someone sends you an email to a defined external support email address. However, if you want to make sure that your email forwarding is working as expected, it is recommended to follow the instructions below and add your forwarding emails to Support Hub. So, as soon as you finish the forwarding process for your email provider, add the forwarding email to Support Hub by clicking the Add Forwarding E-Mail button and by filling in the email inside the input field which will appear in the modal displayed below. Once you add the forwarding email, Support Hub will automatically attempt to verify your forwarding configuration by sending a sample email to the email address you have provided. If everything is configured properly, you will receive a success flash message and email will appear as verified. If something is not configured properly, the status will turn to "Verification Failed" and you will be able to verify it again by clicking the "Try Again" link below the status. In this case, there is most likely some issue with your email forwarding configuration and you should check the forwarding settings again before you click the "Try Again" button, to make sure that everything is configured properly.